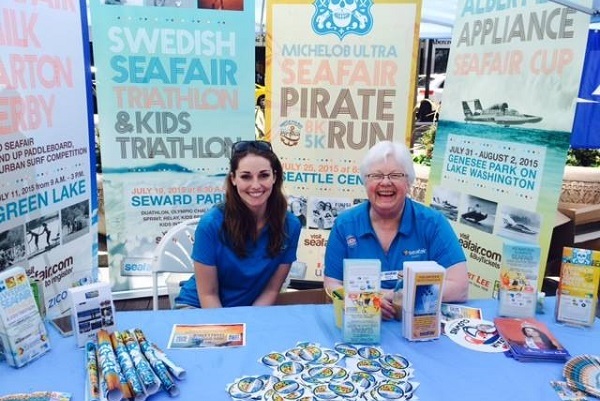 Delaney (L) working a booth at Seafair. As a student, Delaney Berreth (B.A., 2015) did everything she could to prepare herself for a job in the public relations industry. She was a member of the Public Relations Student Society of America (PRSSA) and served as Vice President during her senior year, she went with the Department on a Career Exploration trip to Los Angeles, and did five internships related to PR, social media, and communications. Her plan worked as she landed a job before graduation as the Marketing & Communications Coordinator for Seafair, and she started full-time just two days after walking across the stage to accept her degree. Berreth is also on the professional advisory board for PRSSA at the UW and on the student outreach committee for the Public Relations Society of America (PRSA) of Puget Sound. “During the Seafair season a typical work day usually involves working on site at events in all sorts of capacities, from helping media get the interviews they want, to interacting with the public and telling them about Seafair, to setting up hospitality areas. “During the offseason it’s more office-type work. I create recaps for our sponsors to show them exactly how we fulfilled our contracts, recruit new sponsors for the next season, and do a lot of planning for the upcoming season. “I feel so honored and lucky to have been offered my current job after an informational interview with my current boss. She spoke at a PRSSA meeting and I immediately felt a connection with her as we both have backgrounds in theater and she has a lot of PR experience in the professional sports industry, something I’m very interested in. After our meeting she said she was hiring in her department and thought I’d be a good fit. I interviewed with Seafair’s CEO and HR Director a week or two later, and was offered the job a few weeks after that.